As much as one-third of the heat lost through an uninsulated home escapes through its walls. UK homes built after the First World War typically have external walls made up of two layers with a gap (cavity) between them. These are therefore called cavity walls and were designed to prevent damp penetrating the building. Between 1920 and the mid-1990’s homes were build with cavity walls with the cavity left as a simple air gap. This is not very efficient since a lot of heat can escape through walls of this construction increasing home heating bills and releasing more carbon. Therefore, homes built during the last 10-15 years have been built with this gap filled with insulation – cavity wall insulation. Fortunately cavity wall insulation can be installed in old homes very easily and relatively cheaply – e.g. for a three-bed semi approximately £250 with subsidy or £500 without. Savings of £150-200 per year can be expected and so the payback period for this work is just a year or two. 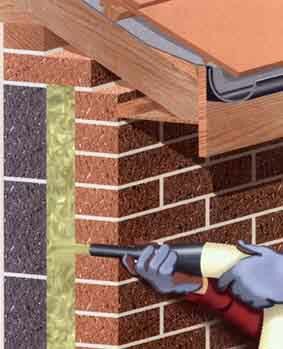 Installing cavity wall insulation typically takes only a couple of hours, and leaves no mess. Small holes are drilled in the exterior of the property through which the insulation can be blown via a hose. This is not a DIY job – it should be carried out by a registered installer offering a 25 year guarantee. See also our article on Loft Insulation.